I love today's manicure...and it's all based on a pillow I'm currently resting on. It was done entirely with the MASH brushes I bought not long ago. I got mine here on Amazon and they've proved to be a pretty invaluable set. At first glance, the brushes seem similar, and I thought I was really only going to get use out of a few, but I was wrong. I used two different brushes for this manicure. The base color is Brisk Blue (Sally Hansen Insta-Dri). This color is one of the first colors I remember buying for myself (besides those adorable Bon-Bon polishes we all used to grab from those plastic tubs when we were kids). It's pretty stunning no? The lighter orange is Papaya Punch (China Glaze) and the darker orange is Meet Me at Sunset (Essie). The black center is Black on Black (Sinful Colors) and its yellow center is Lightening (Sally Hansen Insta-Dri). I also used French White Creme (Wet n' Wild) so that I could get a better finish for Papaya Punch. Beautiful! I am loving every single aspect of this mani! 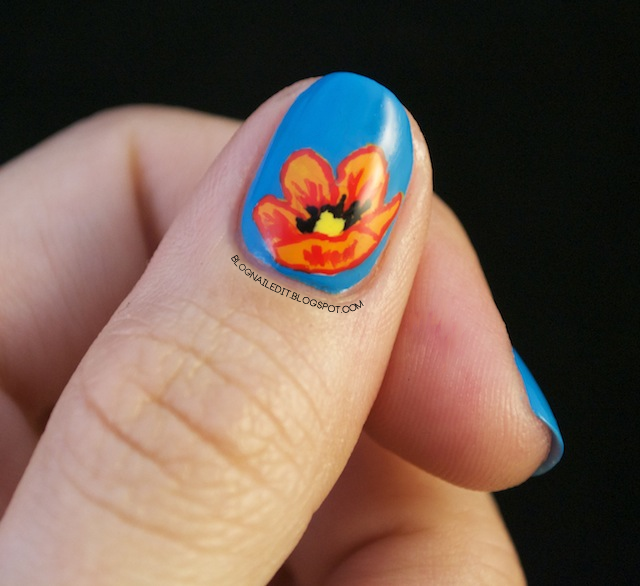 The color combo rocks, the flower is down right amazing and your paint job is flawless! Great work! GORGEOUS! I love this! I can't decide if they're tulips or poppies, but either way they're fantastic! The pop or orange over the blue is to die for! Does Brisk Blue stain your nails at all? I love your art work, by the way. I'm always really amazed when nail art is done with polish. I'm not sure, but we'll find out when I take this off. This is absolutely amazing! I love the blue and orange! Such a great contrast! I love it, great free hand. These colours look amazing together - well done! These nails are gorgeous! I wish I could recreate them! For these more complicated nails, I would LOVE it if I could see a tutorial! I just finally grew my nails out after years of biting about 4 months ago, so my technique is a little pathetic! And I think if I could watch more tutorials of (sort of) basic designs, I'd do better! These are gorgeous! Love the pop of orange on that gorgeous blue. Beautiful flowers, really beautiful. 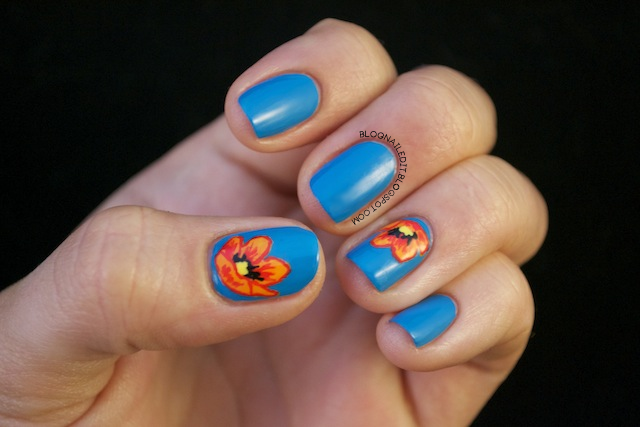 Lovely color combination and a great free hand flower! Beautiful nail art! I like also the combination of colours!